Clean, healthy comfort. 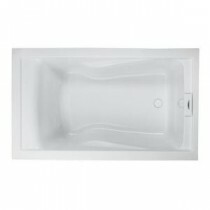 This tub provides a deeper soaking experience when you purchase the optional Deep Soak Max tub drain. This drain raises the water level by 3 in. for a deeper soak. Also, the form-fitted backrest and dual armrests add even more comfort for a truly therapeutic bath.